Enter To Win A $25 Target WOW Gift Card! Welcome to my weekly Target Wow Gift Card Giveaway! Every week I load $25 onto an extra fun Target Gift Card. These special cards all have some kind of fun twist to them and are now retired and can no longer be purchased in store or on Target.com, which makes them even more fun to win! HOW TO ENTER THIS GIVEAWAY: For this giveaway, I am allowing 2 entries per reader. Please leave a separate comment for each entry. Facebook and e-mail entries will not count, so if you want your chance(s) to win the card, please be sure to leave entry comments on this post. Love this!! Would love to win this! I hope I win – thank you for the chance!!! Thanks again, love to win! I’d Love to win this , Thanks!! Such a cute gift card! 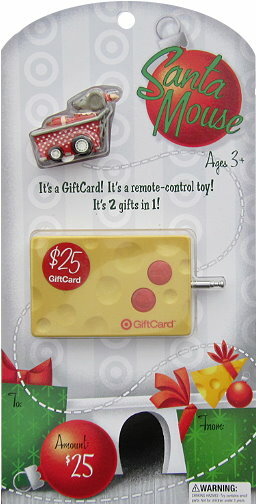 that gift card is adorable!!! Thanks for all your posts…so helpful!!!!! Cute gift card! I would love to win this! Thanks to totallytarget.com i was able to affoard Elmo rocks for my baby. Yeaaa!! Thank You for all your hard work and for 2 chances to win the GC. This really helps my family save money. Thanks for all you do throughout the year. Such a cute card. I would love to win this. Thanks for the chance. Merry Christmas! I already like totally target. Would love to win this! I am a FB fan of Totally Target. I like Totally Target on Facebook already. Thanks for the chance and all that you do. I love Totally Target on FB! We love the Santa Mouse book. This would be great to win! Thanks for the giveaway. entry #1. 🙂 thanks for another giveaway. entry #2. i LOVE you on facebook. These Wow cards get cuter each week!